Eclectic burgers, boozy shakes and house-made condiments elevate this downtown establishment above your typical burger joint. 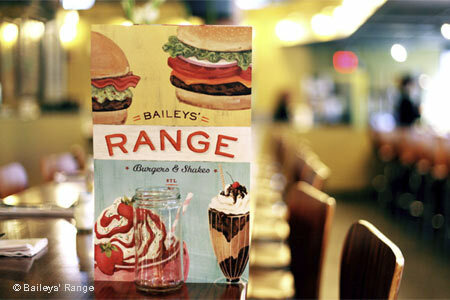 : Topping our list of reality contests: the weekly Burger Battle held here. It continues to be one of the most fun --- and tastiest --- food marketing tactics in town. Contestants can be elaborate, like a lamb patty with fig, feta and a Cabernet reduction, or near-kitsch, as in a muffaletta-inspired burger. Exploring a theme to its fullest is a hallmark of Dave Bailey’s restaurants, and this one is no exception. There’s grass-fed Missouri beef, of course, but also patties packed from duck, chicken or pork, topped with everything from avocado mousse to lemon aïoli to Camembert. The house-made ketchup comes in half a dozen flavors, but the house-made ice cream comes in even more. Booze-infused milk shakes include a favorite that combines bourbon, candied bacon and salted caramel ice cream. Impressive, too, is the selection of local craft beers on tap. Even the draft soda options are the result of serious research.